The Government is proposing to ban the removal of shark fins and the dumping of the shark carcass at sea, Primary Industries Minister Nathan Guy and Conservation Minister Dr Nick Smith announced today. The Ministers made the announcement at the Island Bay Marine Education Centre in Wellington, while releasing the National Plan of Action for the Conservation and Management of Sharks for public consultation. “The practise of finning sharks is inconsistent with New Zealand’s reputation as one of the best managed and conserved fisheries in the world. We need to ensure New Zealand’s 113 species of sharks are sustainably managed and that we use as much of the resource as possible,” Mr Guy says. “Sharks may not be as cuddly as kiwi or as cute as dolphins but they are an important part of New Zealand’s marine biodiversity. Our attitude to sharks has come a long way since the ‘Jaws’ days of the only good shark being a dead shark. This ban on finning is an important step towards improving shark conservation,” Dr Smith says. Seven species of shark are absolutely protected under the Wildlife Act: great whites, basking shark, deep water nurse shark, spine-tailed devil ray, manta ray, whale shark, and oceanic whitetip shark. It is already an offence under the Animal Welfare Act to fin a shark and return it to sea alive. However, it is quite lawful to catch a shark, kill it, remove its fins and dump the carcass at sea. The shark fins are valuable for making shark fin soup which is a delicacy in Asia, and for the production of many traditional Asian medicines. “Banning shark finning in a practical and enforceable way requires that we develop fishery-by-fishery strategies. In some fisheries the ban will be able to be implemented on 1 October 2014. Others will require the development of guidelines for shark handling to maximise the survival of released sharks. The proposal is that all fishing be covered by the ban by October 2016,” Mr Guy says. “Globally 30 per cent of shark species are threatened or near threatened with extinction. Sharks are vulnerable because they grow slowly, mature late and have few young over their lifetimes. For the bulk of our shark fisheries we use catch limits to ensure sustainability. These additional proposals are consistent with the International Plan of Action for Sharks which encourages nations to make full use of sharks taken in their fisheries. This is about New Zealand doing its share to ensure these dramatic creatures of the sea survive,” Dr Smith says. The draft National Plan of Action on Sharks also contains a range of objectives to ensure the biodiversity and long-term viability of shark populations including communication and education, non-fishing threats, international engagement, and research and information. Submissions on the plan close on 8 December 2013. 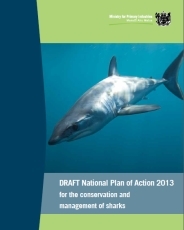 The draft National Plan of Action on Sharks can be viewed here. A step in the right direction. Way to go New Zealand!